A private home wine cellar is a must-have feature for wine enthusiasts desiring to create a space wherein they can grow their wine collection, and entertain friends and colleagues at the same time. 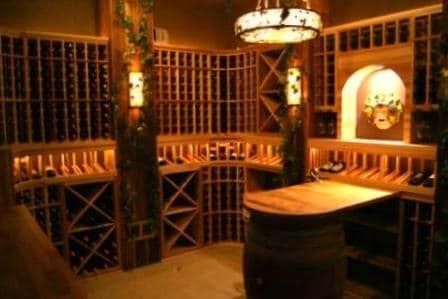 Properly designed and constructed custom wine cellars Palos Heights Chicago should provide the best storage environment for storing and aging wines, and putting together the right mix of custom wine racks Chicago should create a stunning wine showcase layout. 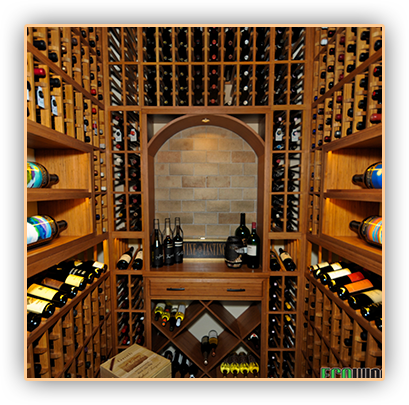 Residential wine rooms Palos Heights are not only designed to achieve the ideal storage conditions, but also to reflect the personality and lifestyle of the wine collector. This is the reason why master wine cellar builders work very closely with their clients. It allows them to address their client’s storage and display needs, as well as accommodate their personal preferences in terms of style and design. For this custom wine cellars Palos Heights Chicago project, the client had a French oak barrel that he wanted to incorporate into the wine cellar design. Master wine cellar builders utilized the retired oak barrel by adding a cooperage wine barrel tabletop and creating a peninsula tasting table, which makes a striking feature in this Palos Heights residential wine room. 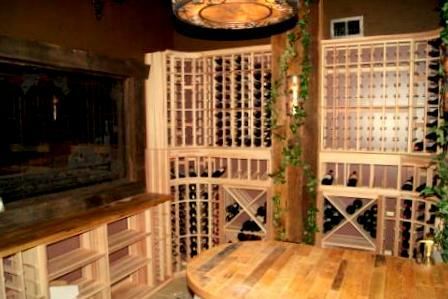 The residential wine rooms Palos Heights project has a total storage capacity of 1,064 wine bottles. 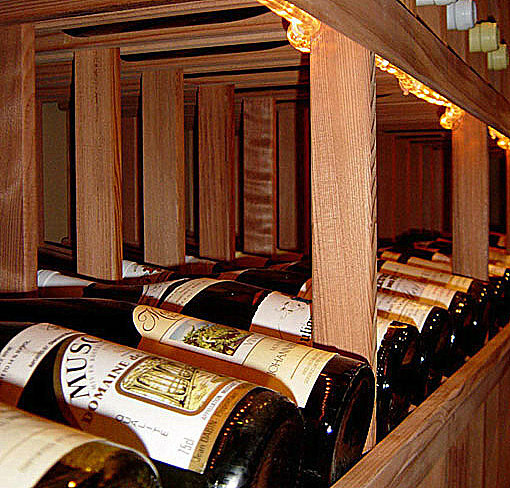 Master wine cellar builders combined different styles of custom wine racks Chicago to create an attractive wine storage and display solution at maximum capacity. The wall below a large glass window features a cooperage tabletop area for serving wines, with additional storage for champagne-sized bottles and wood casings down below. The racking system has a 1 ½ inch toe-kick and base molding at the bottom. The left side wall consists of individual bottle racking, a high reveal display row, and solid X-bins. 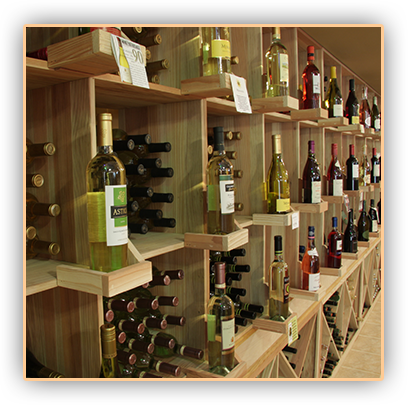 Custom wine racks Chicago with high reveal display wine bottles at a 15 degree angle, which promotes full visibility of wine labels. This type of racking system is also an excellent storage solution, since it can store like wines above and below the display area. LED ribbon lighting was installed behind the light valance, to illuminate the different bottles placed on the display row. A solid arch with puck lighting on the back wall serves as the focal point of the custom wine cellars Palos Heights Chicago project. The arch is flanked with additional individual bottle racking with glass racks to hold wine glasses. More solid X-bins and wood case storage are installed on each side of the back wall, along with single bottle storage racking and a high reveal wine rack display. 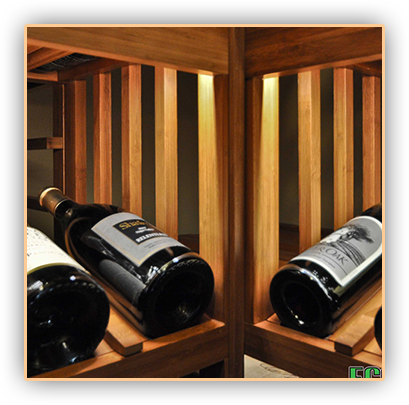 Behind the peninsula table top wine barrel are several openings to accommodate wood casings. The right wall features floor to ceiling solid wine case storage and a solid quarter round display shelf. Quarter round shelves are best for displaying decorative items or wine accessories, like decanters. Curved corner racks were installed in corner spaces to maximize space, as well as create a smooth wall to wall transition. 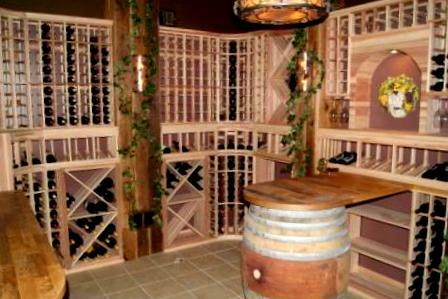 The residential wine rooms Palos Heights project was built in the basement. 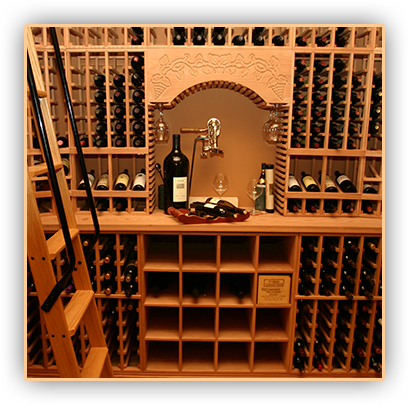 All custom wine racks are made out of unfinished premium redwood, and have solid tops where wood cases can be stored or decorative pieces can be placed.